Just like the girl adventurer in Lewis Carroll’s famous novel, Nasa’s Alice instrument aboard Esa’s Rosetta spacecraft takes measurements to unveil the wonderful world of comet 67P/Churyumov–Gerasimenko, full of peculiar features and yet uncovered atmospheric mysteries. The spectrograph examines the electromagnetic (light) spectrum the comet is emitting to understand the chemistry of the comet’s atmosphere, or coma. 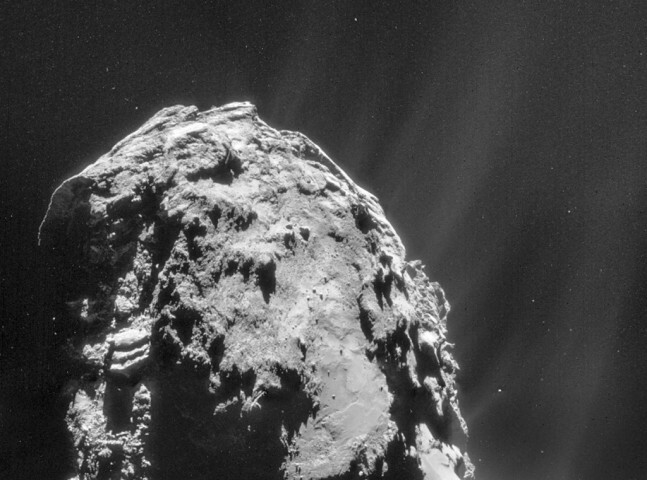 Now, Alice reveals an unexpected process at work, causing the rapid breakup of water and carbon dioxide molecules spewing from the comet’s surface. The scientists report their findings in the journal Astronomy and Astrophysics. Scientists discovered that the molecules seem to be broken up in a two-step process. Firstly, an ultraviolet photon from the Sun hits a water molecule in the comet’s coma and ionizes it, knocking out an energetic electron. This electron then hits another water molecule in the coma, breaking it apart into two hydrogen atoms and one oxygen, and energizing them in the process. These atoms then emit ultraviolet light that is detected at characteristic wavelengths by Alice. Similarly, it is the impact of an electron with a carbon dioxide molecule that results in its break-up into atoms and the observed carbon emissions. “Analysis of the relative intensities of observed atomic emissions allows us to determine that we are directly observing the ‘parent’ molecules that are being broken up by electrons in the immediate vicinity, about 1 km, of the comet’s nucleus where they are being produced,” said Paul Feldman, an Alice co-investigator from the Johns Hopkins University in Baltimore, Maryland. Alice allows scientists to detect some of the most abundant elements in the Universe such as hydrogen, oxygen, carbon, and nitrogen. The spectrograph splits the comet’s light into its various colors – its spectrum – from which scientists can identify the chemical composition of the coma gases. Scientists report the detections made by Alice from Rosetta’s first four months at the comet, when the spacecraft was between 10 km and 80 km from the center of the comet nucleus. From the 10 km orbit in mid-October 2014, Alice observed emissions from atomic H and O above the comet’s limb. “These early results from Alice demonstrate how important it is to study a comet at different wavelengths and with different techniques, in order to probe various aspects of the comet environment,” said ESA’s Rosetta project scientist Matt Taylor. Much of the water and carbon dioxide originates from “plumes” erupting from the comet’s surface, similar to those that the Hubble Space Telescope discovered on Jupiter’s moon Europa, noted co-author Joel Parker, an assistant director in SwRI’s Space Science and Engineering Division’s Boulder, Colo., office. Based on the new Alice data reported in the paper, the explanation for the breakup of those molecules is similar to that for the plumes on Europa, except that the electrons at the comet are produced by solar radiation, while the electrons at Europa come from Jupiter’s magnetosphere, Feldman said. 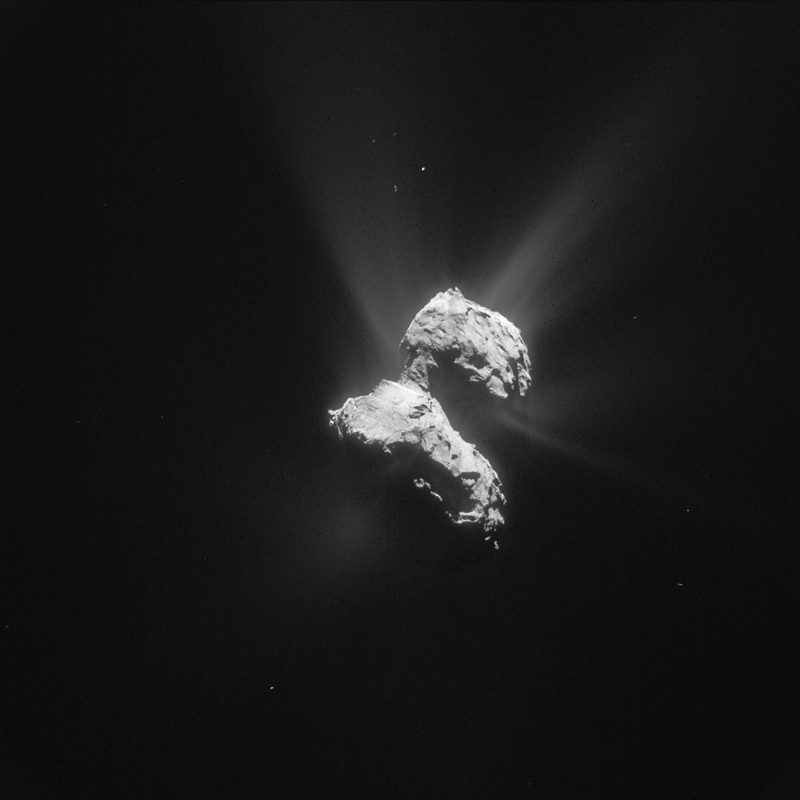 “By looking at the emission from hydrogen and oxygen atoms broken from the water molecules, we also can actually trace the location and structure of water plumes from the surface of the comet,” Parker added. The Alice spectrograph has also studied the surface of the comet and will be used in further studies of its atmosphere as it approaches the Sun and its plumes become more active due to solar heating. 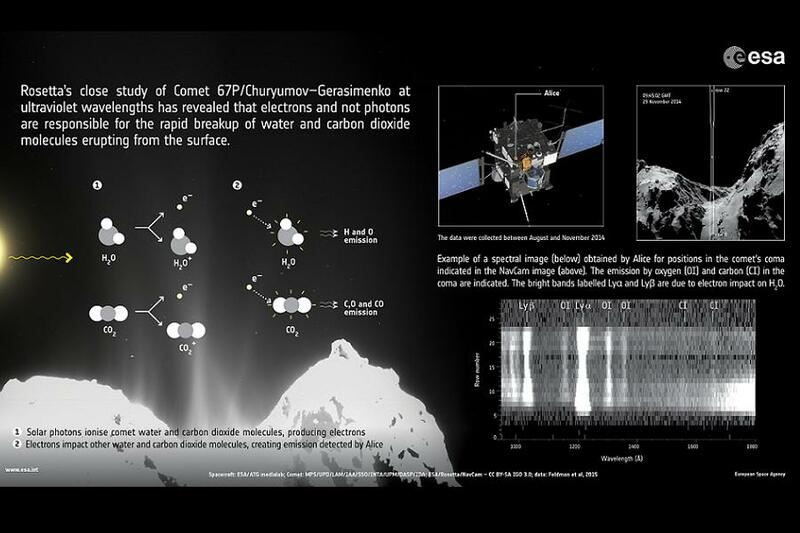 Alice is the only remote-sensing instrument on Rosetta that can detect key atoms if they exist in the comet’s atmosphere. Scientists revealed that more detailed future analyses, combining the Alice spectra with data obtained by the other remote sensing instruments and in situ particle measurements, are forthcoming. The comet observations will help scientists learn more about the origin and evolution of the Solar System and the role comets may have played in providing Earth with water, and perhaps even life. 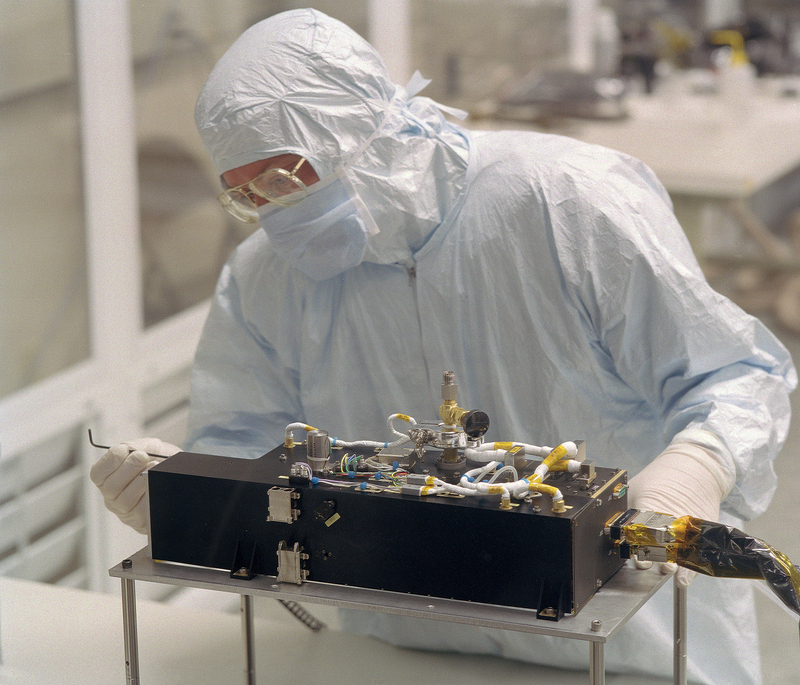 The Alice instrument is one of two ultraviolet spectrometers named Alice currently flying in space. The other is on board NASA’s New Horizons spacecraft, which is destined to make a flyby of Pluto in July.